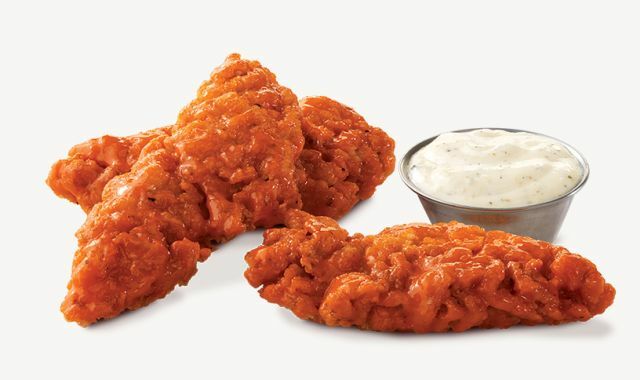 Perhaps looking to capitalize on the popularity of Buffalo chicken wings this time of year (without actually serving Buffalo chicken wings), Arby's serves up new Buffalo Chicken Tenders for a limited time. The new menu item is a fairly easy lift for the chain as it simply combines the Prime-Cut Chicken Tender with spicy Buffalo sauce and serves it with ranch on the side for dipping. You can also think of it as the Buffalo Chicken Slider minus the bun with the ranch on the side (which is probably how you can still order if after it's gone from the menu). The new tenders come in either 3- or 5-piece orders.